It seems like the wall-to-wall carpeting fad is leaving and more folks, including those with green intent, are returning to hard floors: hardwood, linoleum/marmoleum, cork, tile/travertine, etc. Still wanting a soft touch here and there, prompts the need for area rugs. I’m in love with the modular FLOR rugs that come in several styles, colors, and prices. But if you’re looking for something a bit more original, with an artistic flare, and just as green, look into Peace Industry’s felt area rugs. Melina Raissnia (co-owner), is an artist who has uncovered and restored a disappearing Iranian rug making tradition. 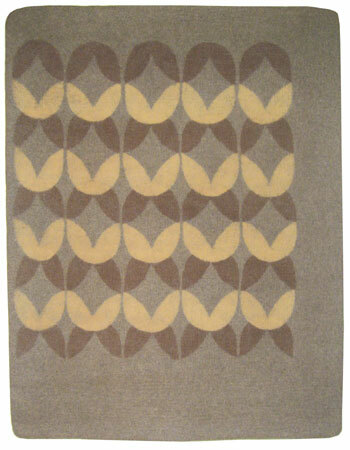 The rugs Melina designs are made of 100% wool and colored using natural dyes. The rugs are made by hand and done in small batches to ensure quality and uniqueness. These eco-friendly rugs are chemical-free and fair trade. Unlike most rugs, when using felt, the wool is not woven, but pressed, creating an incredibly dense, strong, & durable textile. As you know, wool shrinks when hot and wet. This is part of the felting process. The design emerges as the colored wool is pressed into the rug. As already mentioned, Peace Industry is committed to a healthy environment. The ancient felting process is not harmful to the environment and this rug creation process requires only the wool that is washed with mild soap, and biodegradable vegetables for dying the wool. Read more about their commitment to the environment and to fair trade here. Prospective buyers can order swatches and even request custom sizes and design. Click here to view Melina’s current collection. If you like the contemporary, simple designs, you’re sure to love her art as well. The hues have an organic feel and the basic designs are charming and soothing. I would love to have a few of these in my home. Currently, you can purchase your Peace Industry designed felt rug at their studio in San Francisco, and at Design Within Reach, which are found throught the US and in Canada. You can also contact Peace Industry directly here. Keep in mind, you’re not just buying a rug, but a piece of art underfoot. I’m loving these felt rugs beautiful design and eco friendly too!! Thanks for the link to your beautiful rugs…I love the geometry.